Ankle injuries are extremely common. The most common ankle injury is a sprained ankle, but ankle pain can have numerous sources. Ankle pain that results from injury are often thought of as sports injuries. But you don’t necessarily have to be an athlete or even a social sportsperson to twist your ankle. Something as simple as walking on an uneven footpath can cause a rolled ankle, resulting in an ankle sprain. Ankle injuries can potentially occur at any age. Thousands of people sprain their ankle everyday around the world. Just while you’ve been reading this article a few hundred people have sprained their ankle. 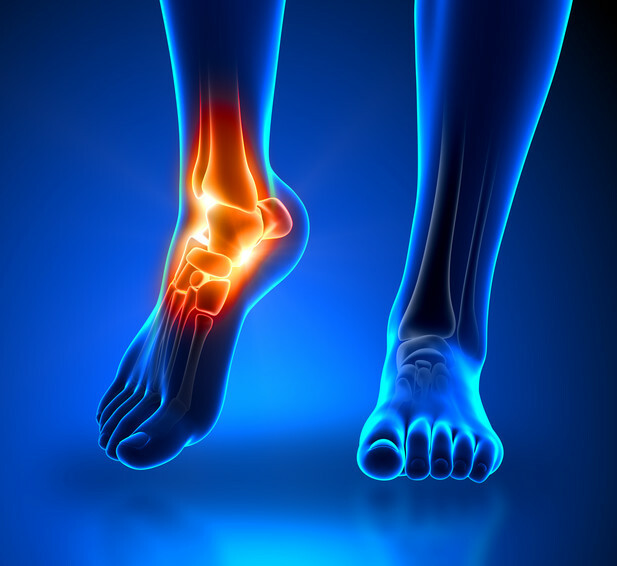 While ankle pain can result from a large number of ankle and foot injuries, the most common ankle injuries are sprains (low and high ankle), which involve ligaments and bones in the ankle. But you can also fracture a bone, tear muscles or over-stress a tendon. What Causes Common Ankle Injuries? Ankle injuries are commonly categorised by the kind of tissue you injure eg bone (fracture), ligament (sprained ankle), muscle (strain or tear), or tendon (tendinopathy or tendonitis). The ankle joint is where three bones meet — the tibia (shin) and fibula (thin bone outside of leg) and the talus (ankle bone) above your heel. Your ankle joint is passively stabilised by your ankle ligaments, which are semi-elastic bands of connective tissue. These limit the normal motion that occurs in your ankle joint. Your ankle muscles and the tendons that they act upon dynamically control, move and protect your ankle joint, In simple terms, your muscles move your foot and stabilise your ankle joint to avoid you overstretching your ligaments. Unfortunately, when your ankle muscles lose control or are not quick enough, your ankle ligaments are not protected, your ligaments are overstretched resulting in an ankle sprain or ligament rupture. Ouch… that hurts! An ankle fracture occurs when there is a break in one or more of the bones. The most common ankle fractures are avulsion fractures of your distal fibula, Potts fracture of your tibia and fibula simultaneously and talar dome fractures, which all need to be accurately diagnosed and professionally managed by your health professional to avoid long-term foot and ankle issues. While muscle strains are more common in your legs, there are important muscles which converge into tendons that wrap around your ankle to stabilise your ankle and foot to protect them from sprains and allow you to walk and run. These muscles are also very important to provide you with a normal foot arch and avoid flat feet. Your muscles or tendons can become injured or inflamed as a result of overuse or trauma. The inflammation is called tendonitis. They can also tear, completely rupture, or sublux out of place. We categories tendon injuries as tendinopathies. As you can see, there are actually a lot of common ankle injuries – not just sprained ankles. It is important to accurately diagnose exactly what is wrong with your ankle to ensure that both your short and long-term treatment goals are achieved as soon as possible. With accurate assessment and early treatment, most ankle and foot injuries respond extremely quickly to physiotherapy allowing you to quickly resume pain-free and normal activities of daily living.